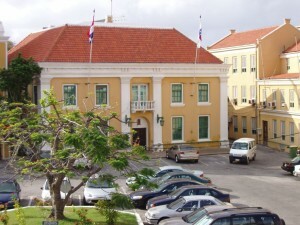 WILLEMSTAD – The Union Alliance, consisting of STrAF, NAPB, ABVO, SAP, STSK and SITEK have made an appeal to all their members to stay calm, especially after Prime Minister Ivar Asjes used the word “escalation” for all the austerity measures against the government employees, also after some documents were leaked to the media about the unions’ thoughts about these measures. The unions indicated that probably the reason behind the leaking of these documents is to turn the members against their union representatives. But according to the union leaders, this will not happen. The Union Alliance and its leaders called on the government to keep their hands off of the public employees. They also condemn the fact that the government wants to impose measures on the employees with a dialogue. For the alliance, the only way to reach an agreement is through dialogue. That is why the deadline, which was set by the government, to reach an agreement, does not mean anything for the unions. If the parties don’t reach to an agreement before the government takes these measures unilaterally, then there are legal procedures available for the unions to act against the government. The parties can also appoint a mediator to take the necessary steps for the negotiations. The last step is to go to court. “There must be valid reasons that indicate that the social benefits or employment conditions of the Civil Servants are destabilizing the economy of the island. Only then, the government can make changes or introduce their austerity measures,” the union leaders said. The leaders also questioned the fact that someone leaked their 6 page documents in which they indicated their thoughts about the measures and the government’s actions. “They should have acted upon it, but instead the leaked it to the press and it was presented in an incorrect way. This document should have been handled in the Council of Ministers. We still haven’t heard anything from them,” one of the union leaders said. In this document, the union leaders indicate that they agree that the civil servants should be part of the basic insurance, but that they should keep their social benefits. The government indicated that they will introduce a general health insurance, but according to the unions, they don’t see that happening any time soon. That is why the civil servants would like to keep all their benefits if they become part of the current basic insurance. The Union Alliance indicated that they are only fighting for their employment rights. They asked for government not to seek confrontation, because they will get exactly what they asked for.